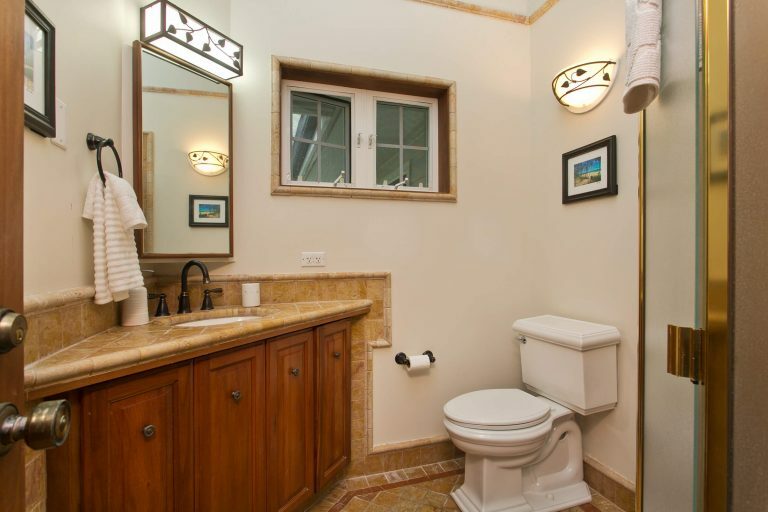 This four bedroom, four bathroom beachy charm vacation rental is ideal for families. 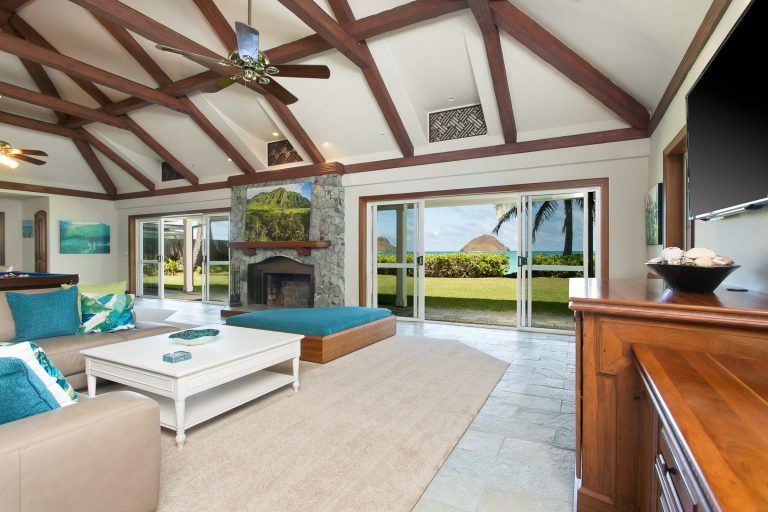 It features high vaulted ceilings, a large open living space, perfectly manicured yard and access to a gorgeous white sand beach just yards away. 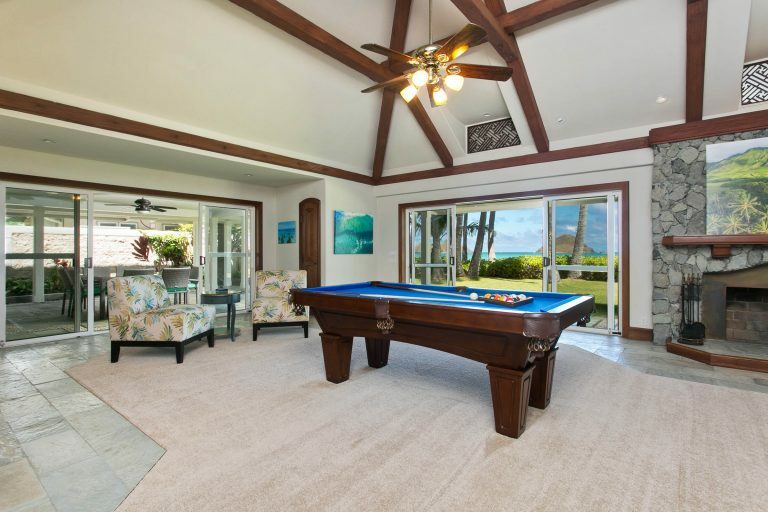 This beachfront vacation rental features a gourmet kitchen, fully appointed with all brand new stainless steel appliances, including a wine fridge and double oven. 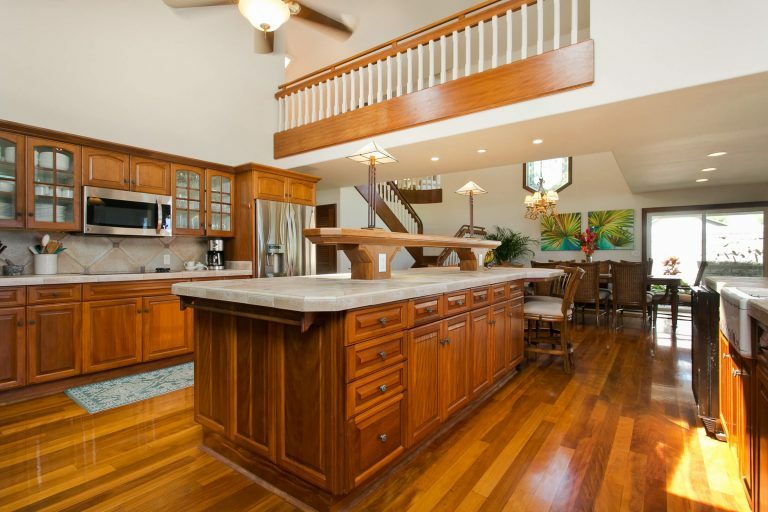 Two large islands with 8 counter stools allow for prepping and enjoying each others company while cooking. A delightful feature in the kitchen is a Dutch door leading out to an herb garden within close reach, as well as a koi fish pond. The indoor dining room has a large plantation style table that seats 8. 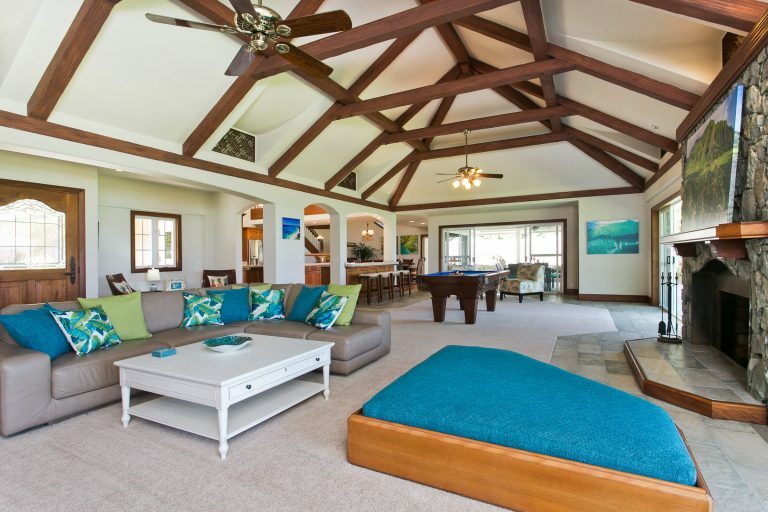 The open, spacious living room includes a pool table, daybed lounge, 60″ screen tv, dvd, and a portable sound system that pairs with you device. 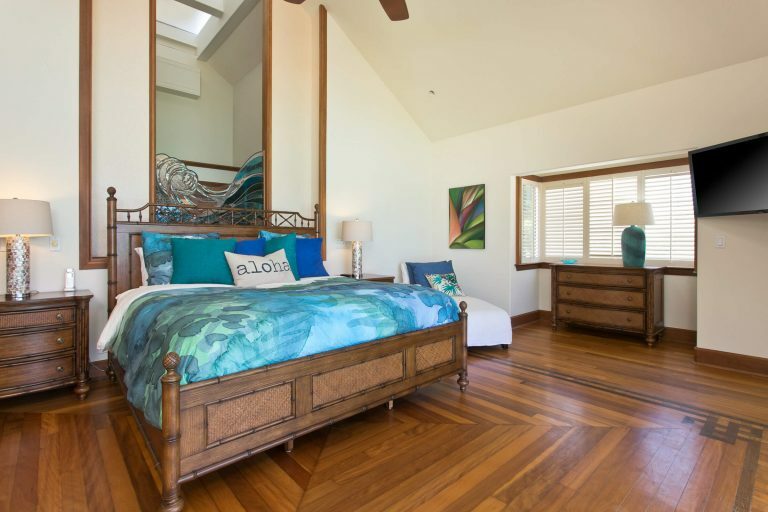 Upstairs, the large master bedroom with lanai boasts the perfect view of the famous Mokulua islands. 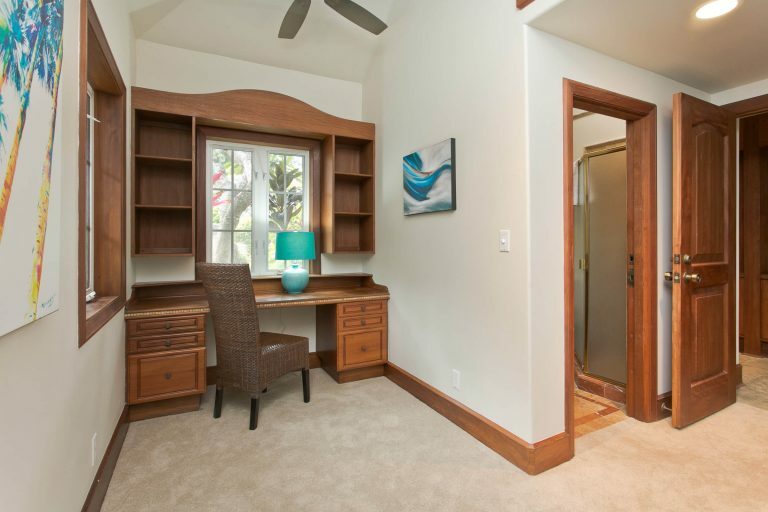 This room has a king size bed, tv, and chaise lounge for reading or just taking in the spectacular view. 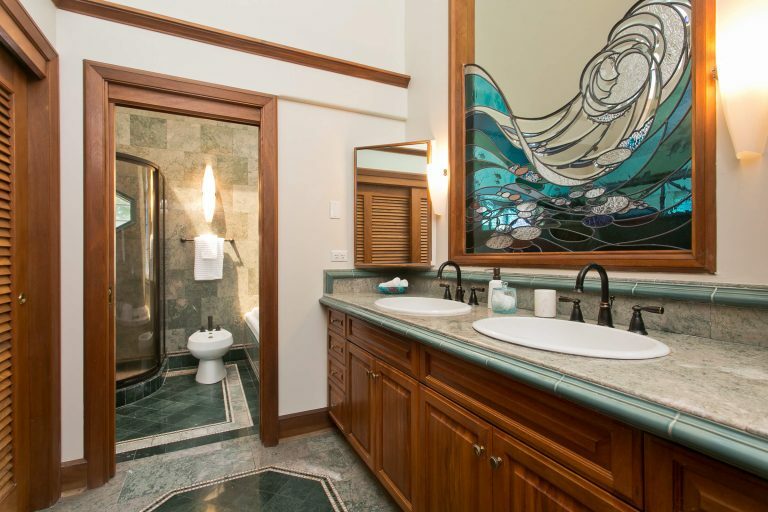 The master bathroom has a jetted tub, shower, double sinks, and several skylights, along with gorgeous stained glass accents opening into the bedroom. Also upstairs, the 2nd bedroom has a built in pull out king size sofa bed and a king size bed. 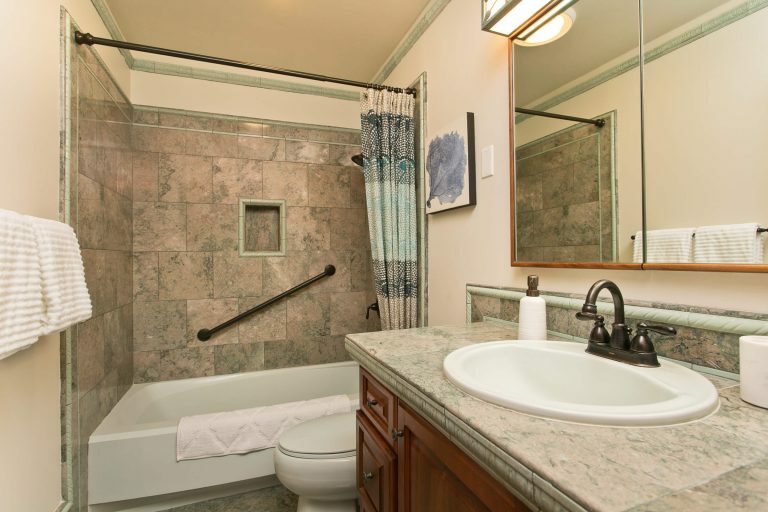 The attached full bathroom has a unique claw-foot tub adjacent to the open shower. 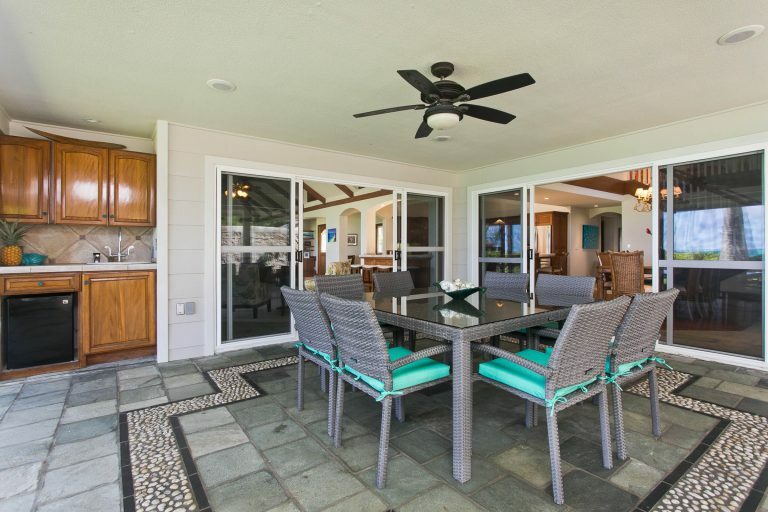 Attractive French doors open to a small lanai with an ocean view. Downstairs the 3rd bedroom with king bed and tv has a full bathroom and sliding doors opening to the back yard. 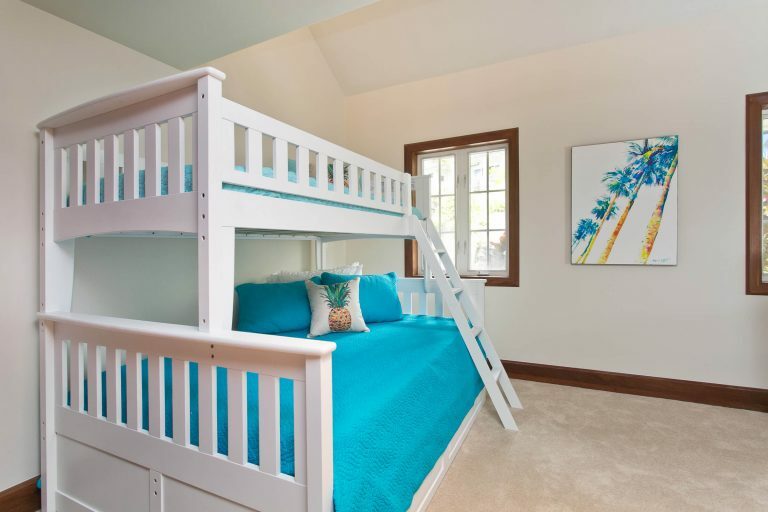 The 4th bedroom has a twin over full bunk with a pull out trundle which can sleep up to 4. 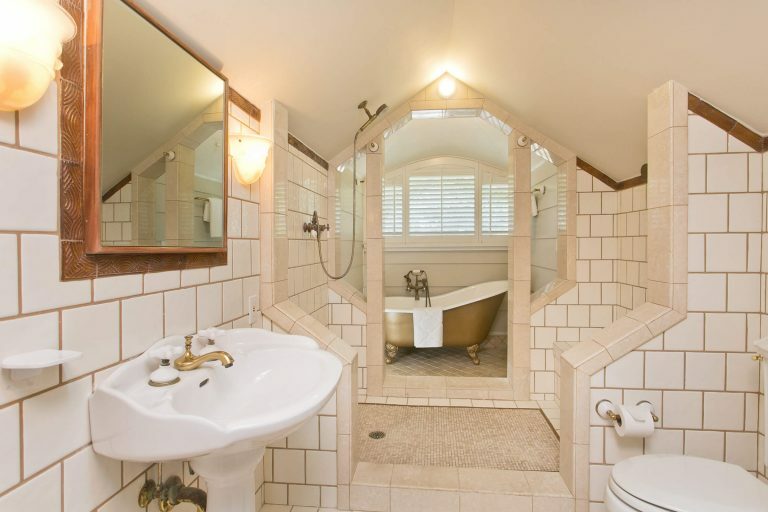 This room has a built in desk and an attached full bathroom with shower. 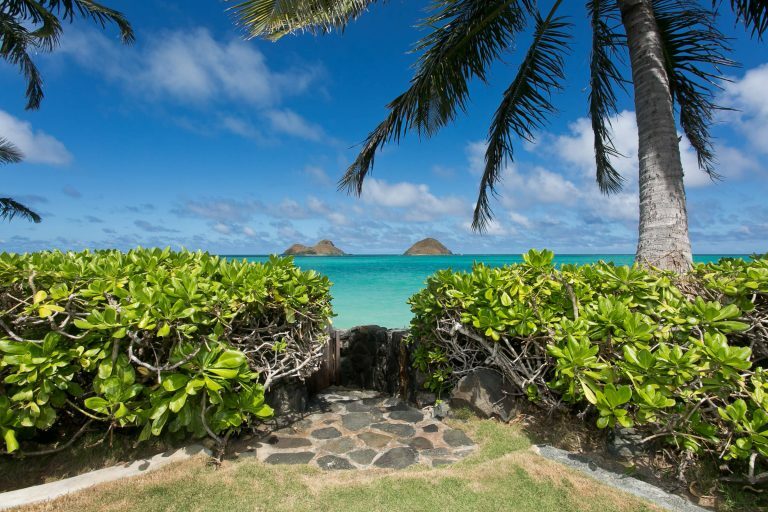 The rental homes expansive back yard faces the Mokulua Islands. 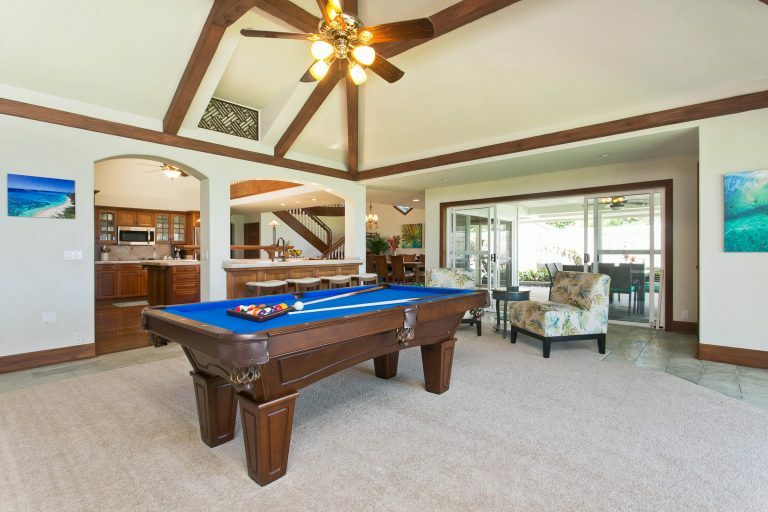 The covered outdoor living area has a dining table for 8, a BBQ, outdoor sink, water filter, fridge, cabinets, a hot shower and unique stonework. 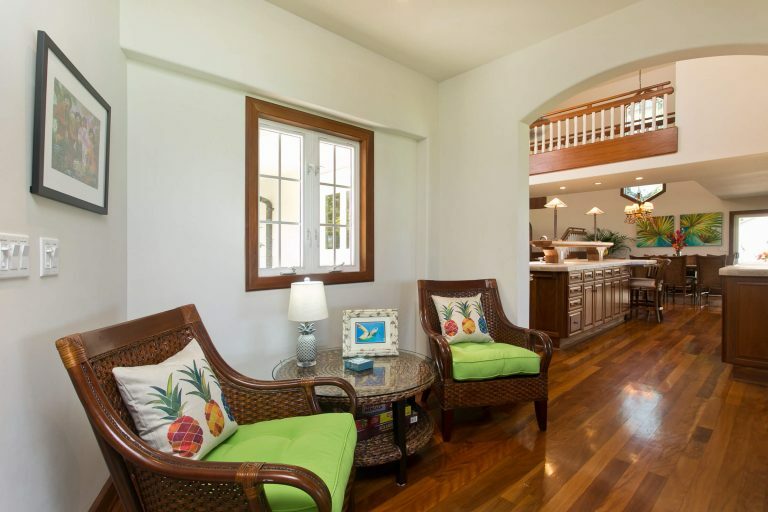 Luscious native plants, palms and bamboo trees surround the home. The double garage is equipped with a washer and dryer. 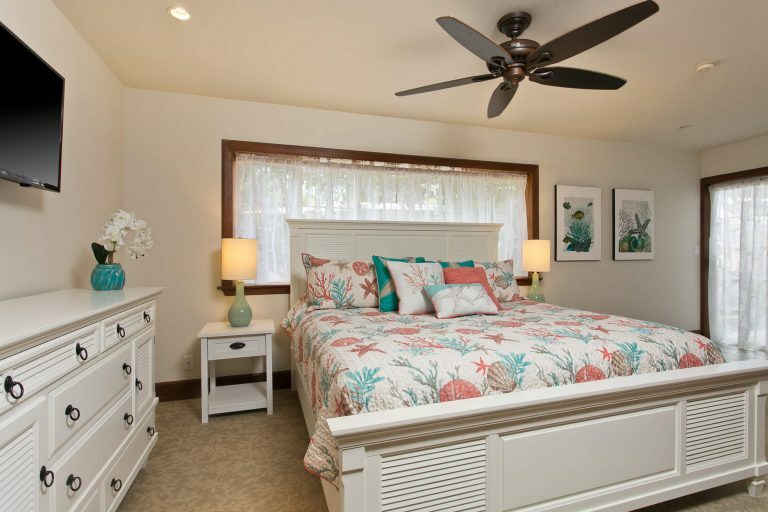 The home has fans throughout and with the windows open offers a gentle tropical breeze to keep the indoors cool. 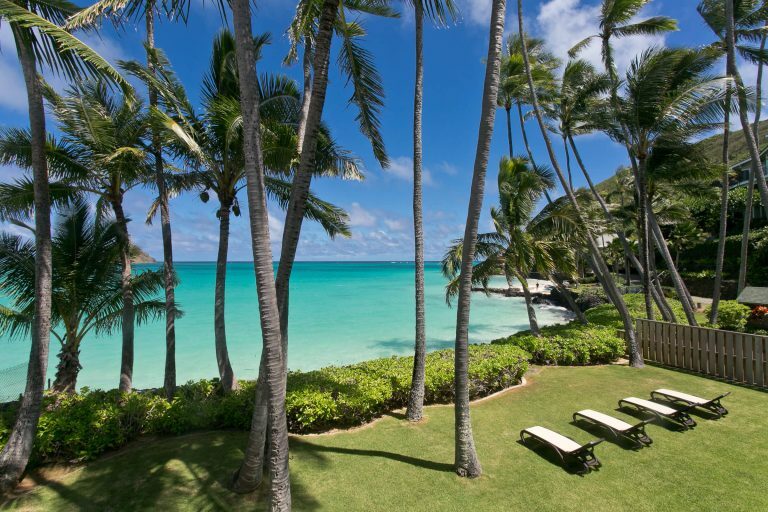 If you are seeking a well equipped, elegant home with the famed North shore sunsets, spacious yard and silky white sand beaches minus the crowds then look no further. Our respite here mid September was for some much needed R & R. Our stay here ticked all the boxes for a fun filled family vacation. 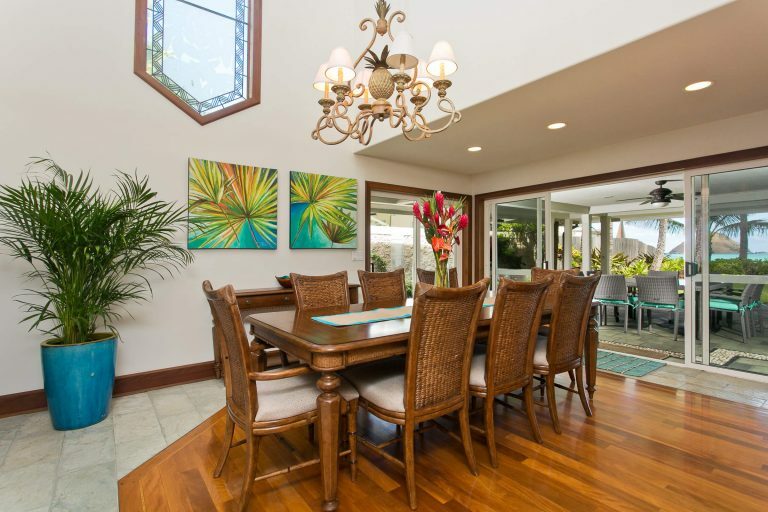 The home is minutes away from the famed Sunset Beach. 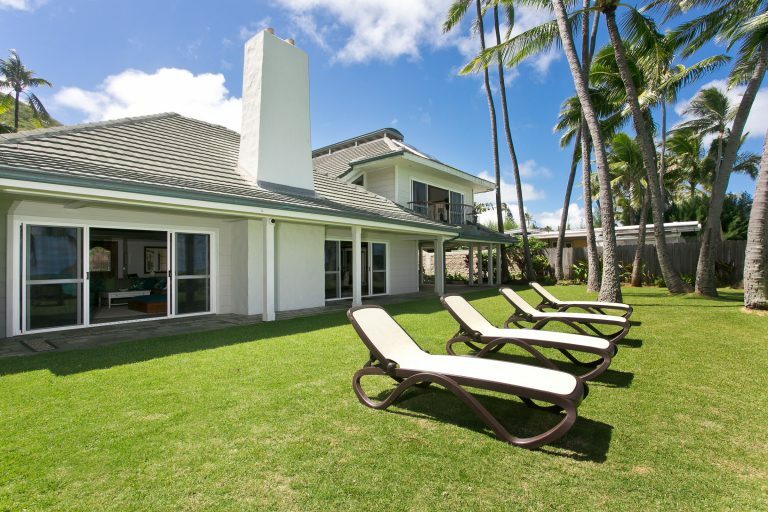 Also nearby is Turtle Bay resort and the charming town of Haleiwa with its unique shops, restaurants and food trucks. Despite all the nearby enticing attractions we basically stayed put, lulled by the sounds of the ocean waves (literally at our feet), as we enjoyed our daily dose of sun and ocean air from the comfort of our huge wrap around deck. Life doesn’t get much sweeter! The minute you enter the property, the world melts away and heaven awaits. 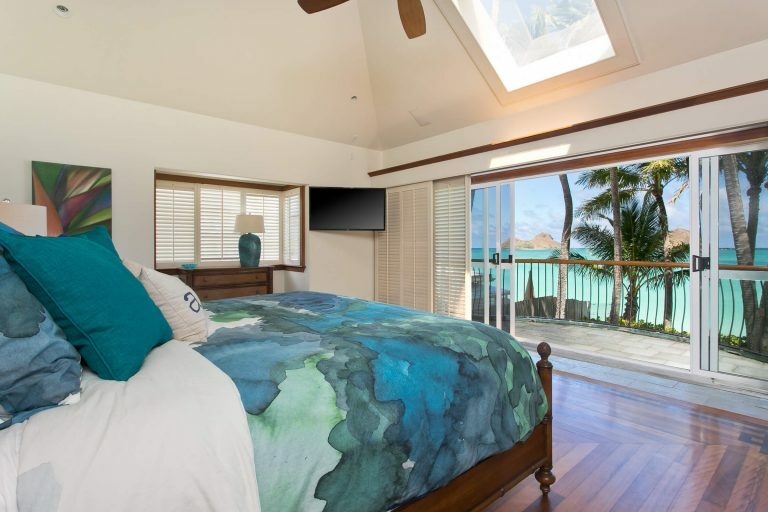 Beautiful house, comfortable accommodations, large wrap around yard, decks for relaxing and ocean viewing, fire pit for cozy gatherings and marshmallow roasting….and miles of wide white sandy beach to stroll, and unbelievable sunsets! World class surfing directly in front of this house makes it perfect if you are a surfer or simply one who wants to watch. 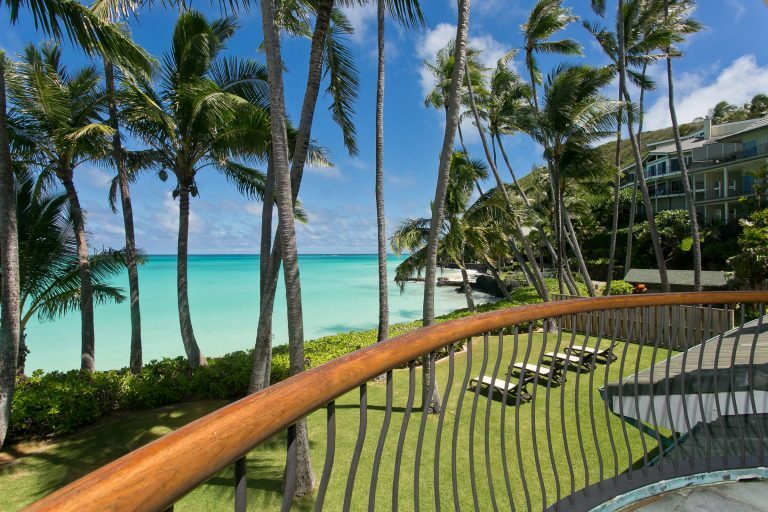 Several more world class surf spots just a few short minutes from your lovely deck. 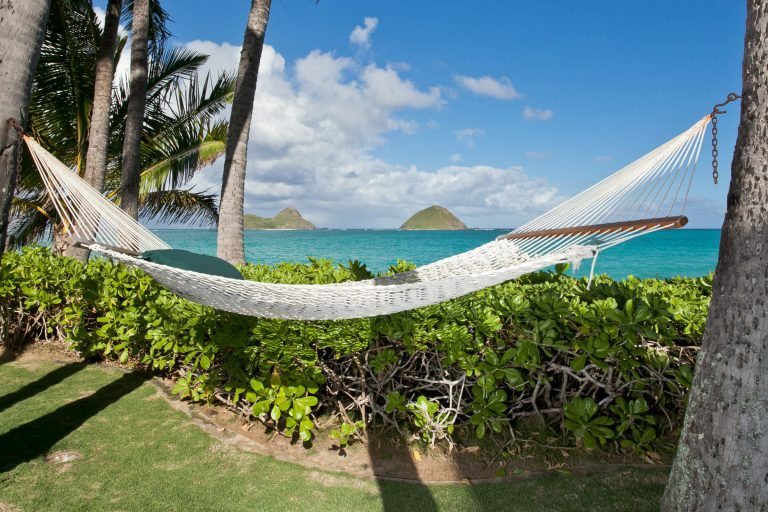 We loved the privacy of the property, the casual luxurious comfort, close proximity to fresh produce stands and amazing places to eat, and we were thrilled to spot turtles and breaching humpback whales the last time we were here during whale season! We have traveled the world and stayed in many vacation homes. This was by far the best experience we’ve had. The house and property are magnificent. 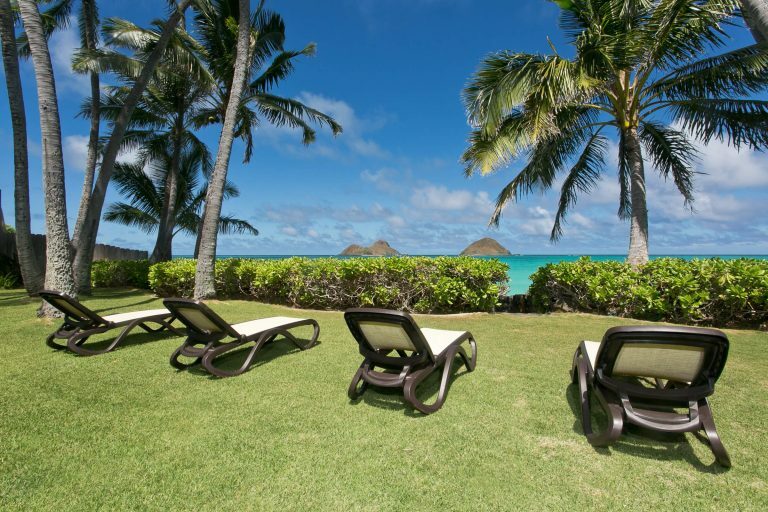 It’s gated location provides a nearly private beach front. We started and ended our day with a beach walk, and a jump in the ocean. The hot outdoor shower makes for a quick rinse off. We made a fire nightly(SMORES), and gazed at the stars. 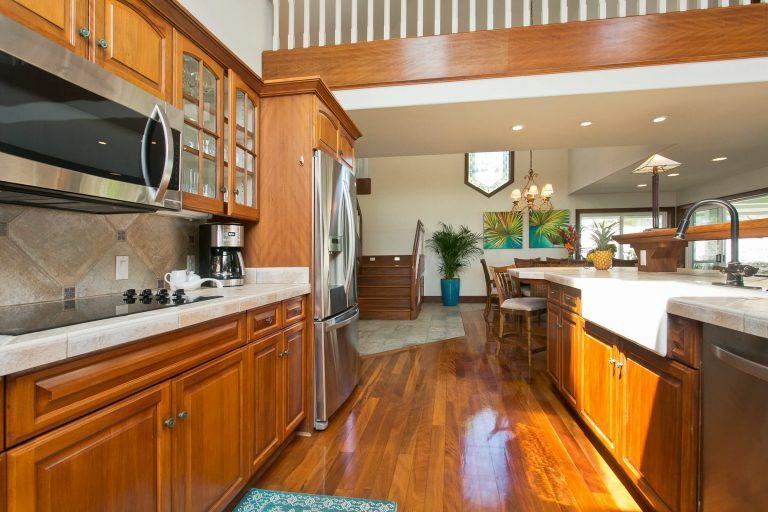 The chefs kitchen was perfect for making most any meal. The area has numerous fruit and veggie stands, grocery stores, and fresh fish markets. Famous kahuku shrimp are just down the road. “Ted’s bakery” is perfect for a tasty breakfast or lunch. The ocean out back is protected and provides a safe swimming area. 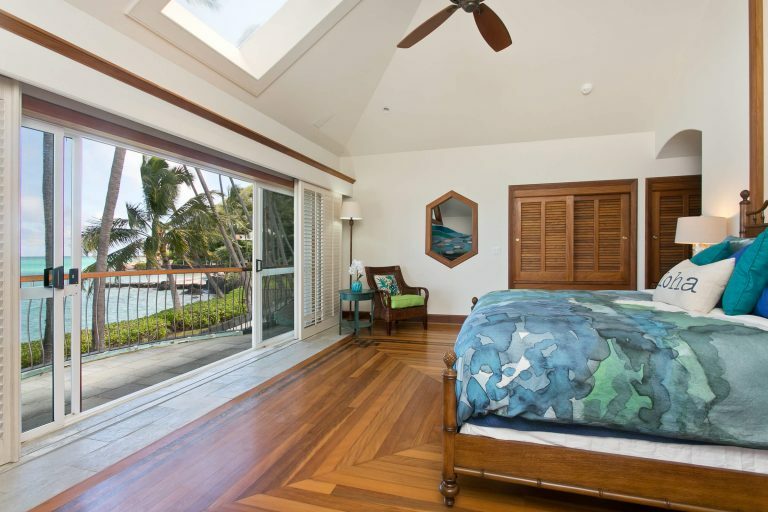 The master bedroom has a patio overlooking the sea. Each morning I had my coffee and let the sea take my cares away…the home is incredibly secure, we had no worries about our belongings. It was spotless upon arrival, and the laundry facility was perfect! my wife and I had the best vacation. The house was big enough a huge family for sure. It’s just such a beautiful, pristine, quiet spot on the planet. We can’t wait to stay there again. There is a bike trail, and many Hikes close by! I’d definitely recommend this home for any vacation you have. Romance, family, honeymoon, etc.